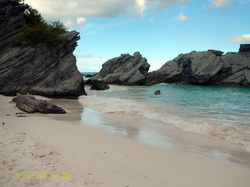 Horseshoe Bay is undoubtedly Bermuda's most popular beach. It is a large crescent-shaped beach with great rock formations at either end. In between is fluffy, pale pink sand lapped by turquoise water. It has facilities including places to get a snack and to rent beach furniture. As a result it is popular with locals as well as with cruise ship passengers. Located along Bermuda's southwest shore, Horseshoe Bay is not far from the Royal Naval Dockyard where almost all cruise ships dock during a call in Bermuda. It is along the South Road in South Shore Park about a half hour from the Dockyard. One would be hard pressed to walk to Horseshoe Bay from the Dockyard. The distance is significant, the roads are narrow and usually quite busy. Thus, as a practical matter, you have to take some mechanical means of transportation to get there. Most cruise ships offer a transfer to Horseshoe Bay as a shore excursion. These usually involve a ride in a minibus to and from the beach and cost about $30 per person. There are other alternatives. Taxis are usually waiting near the pier. These are regulated by the Bermuda government and are metered. The rates depend upon the day of the week and the time of day. The government estimates that a typical fare for one to four passengers to Horseshoe Bay is $34.50. For five to seven passengers, it estimates that the fare will be $43.50, one-way. Another alternative is a minibus. Again, these are regulated by the government. The fare to Horseshoe Bay would be around seven to eight dollars per person with a minimum of seven passengers per minibus. 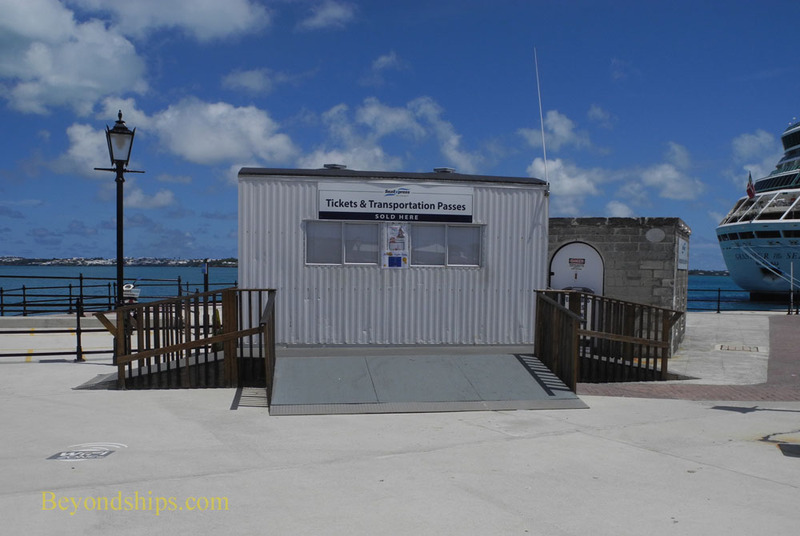 Although every cruise line that calls in Bermuda strongly cautions passengers not to rent motor scooters because of the potential for serious accidents, there are places to rent motor scooters next to where the ships dock. In addition, there is a place to park scooters at the bottom of the hill overlooking Horseshoe Bay. A popular alternative is to take the public bus. Pink with blue trim, these buses are easily identifiable. The number 7 bus runs from the Dockyard along the south coast and has a stop at Horseshoe Bay. In addition to the local version, which makes a number of stops along the way, there usually are buses that go directly from the Dockyard to Horseshoe Bay and back. Going to the beach, these can be found in the parking area near where the Heritage Wharf and King's Wharf piers meet. Going back, they wait at the Horseshoe Bay bus stop at the top of the hill overlooking the beach. The adult fare is $4.50 one-way with children over 5 and under 16 years of age paying $2.50. The buses require exact change. If you buy tokens beforehand, the adult fare is reduced to $4.00. 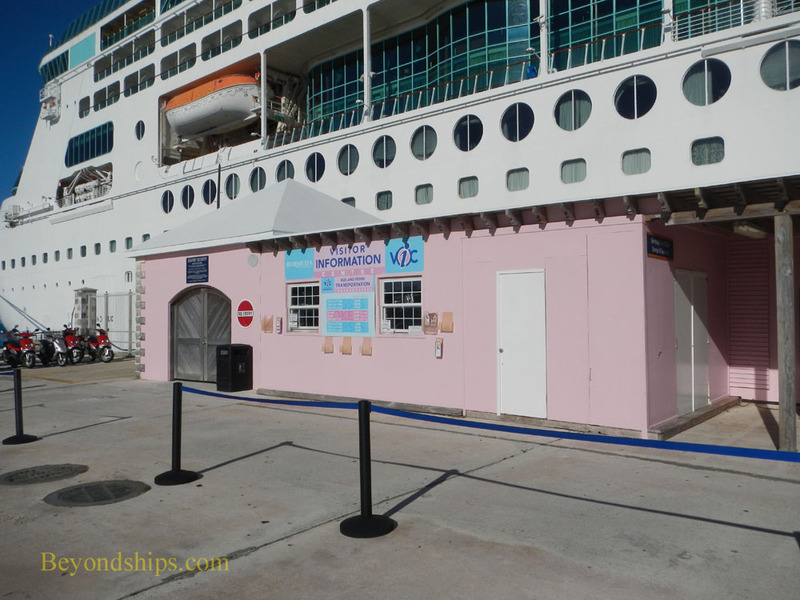 What many cruise passengers do, however, is to purchase a transportation pass. These allow the holder to take as many trips on Bermuda's ferries and buses as he or she wants. The passes come in single day up to seven day varieties. But most people opt for a one, two or three day pass to coincide with the length of their ship's stay in Bermuda. The one day pass is $15.00 for an adult and $7.50 for children. The two day pass is $25.00 for adults and $12.50 and the three day is $35.00 and $17.50 respectively. Multi-day passes have to be used on consecutive days. Thus, if your ship is in Bermuda for three days, you cannot buy a two day pass and use it on the first and third day of your stay. Of course, if you are planning to do all your sightseeing and beach activities on the first two days of a three day stay, a two day pass is all you need. The hill leading down from the South Road to Horseshoe Bay is quite steep. There is a paved road and sidewalk but some people find it a taxing experience to walk up the hill to the bus stop, especially in hot weather. 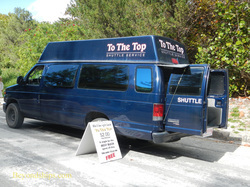 Seizing an opportunity, a local entrepreneur operates a van service that will take you up the hill for $2.00. While most cruise passengers go to Horseshoe Bay, there are a number of other beaches in Bermuda's South Shore Park (see separate article). These are less crowded and often prettier than Horseshoe. A number of these beaches (e.g., Warwick Long Bay) have their own parking areas and are served by their own bus stops. If you want to go directly to one of these beaches, you will need to take the local number 7 bus (or a taxi or minibus). Alternatively, you can go to Horseshoe Bay and walk along the coast to these beaches along the trail that connects them. So far, we have just spoken about going from the Dockyard to the beaches. However, it is also possible to go from Bermuda's capital city Hamilton to Horseshoe Bay. Thus, you can take the fast ferry into Hamilton from the Dockyard, do some shopping or see the sights of the city and end the day at the beach. To go by bus, you can board a number 7 bus at the bus terminal, which is next to the City Hall on Washington South street. Again, it will take about half an hour to get to the South Shore beaches. (The fares discussed in this article are from 2014). Above left: There are facilities including a cafe and a beach rentals shop at Horseshoe Bay. Above right: The bus terminal in Hamilton. Below: Transportation passes are sold next to where the cruise ships dock.